Direct marketing and no membership dues. In 2015, 38.1 million visitors came to the Seattle area to breathe the fresh air, see fabulous views, experience diverse neighborhoods and taste local flavors. While here, those visitors contributed $9.7 billion in expenditures to the greater Seattle and King County economies. Ready to get in on it? Seattle Southside RTA is a national award–winning destination marketing organization. Through a coordinated, cooperative alliance with our regional travel and tourism business community, we’ll successfully position your business in Seattle Southside&apos;s growing travel and tourism industry. Working with Seattle Southside RTA provides you direct access to the lucrative business, group and leisure travel markets. We offer opportunities to network with other businesses, make contact with and advertise directly to visitors, and help build awareness for your business. Newsletters such as the semi-monthly leisure e-newsletter Travel Update and the monthly partner e-newsletter At a Glance feature articles, spotlights, facts and tidbits about events, industry updates and visitor information. Readership is over 20,000 and growing daily. Listings in our annual “Travel Planner” and “Dining Guide” publications and on our website can include your company description, website and contact info; photos; videos; coupons; reviews; and more. All web listings can be updated to add new information or promote specials and events. Weekly blog articles can provide a more in-depth description of local businesses and activities. Inclusion in relevant story pitches to travel writers and other media outlets. Familiarization tours highlight local tourism-related businesses to other industry affiliates and media. Dynamic social media engagement with fans. This is a mobile exclusive program designed to drive more traffic to your business. 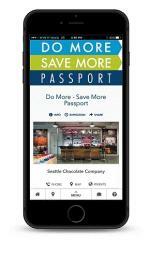 Provide deals/ discounts to be added to the savings passport. You can provide an already existing deal, no need to create a new offer. The passport targets individual and group customer segments based on demographics, interest, duration of visit, and other factors. There are no apps to download and the passport is instantly delivered via email and text. Because this is a mobile-exclusive program, redemptions occur directly through the customer’s phone. There are no print-vouchers to deal with. The technology is very flexible on how it can work with your business process. You have the option to supply a promo code, barcode, a simple voucher, or a link for the customer to make a purchase. To participate in the Do More – Save More Passport Program please click the button below to visit the partner site to fill in the required information and a representative from our vendor company, Bandwango, will reach out to you with onboarding information. Referrals by staff who engage directly with area visitors. Connect with convention, meeting and event businesses through our sales team, and attend trade shows and events with RTA team members. Media and travel writer referrals sent to relevant partners. Use of media library for brochures, videos and other marketing materials. Free brochures, maps, facility and area guides and coupons for use at events. Promotion of your press releases, specials or deals in tourism trade and travel media. Valuable search engine optimization from outbound links on the Seattle Southside website to partner websites. Meet industry experts at events and learn about the economic impact of tourism and how you can support the industry. Receive access to industry data. Annual Tourism Symposium and other business development events.